Start-up is the first part of the run-up. To get into the momentum or pick up the momentum, start-up is the key factor. In any type of bowling without start-up you cannot get into momentum. It is the initial energy of your run-up. It is the booting factor of your run-up. It sets the momentum of your run-up. Momentum is the 2nd part of your run-up. The momentum of your run-up always depends on your legs. The fitter the legs the stronger the momentum. Fitness of bowlers legs is Crucial. Momentum of your run-up also depends on how do you start your run-up, infact start-up. If you are a fast bowler the momentum of run-up might be faster. If you are a medium pace bowler the momentum of run-up might be medium. If you are a slow bowler the momentum of run-up might be slower. 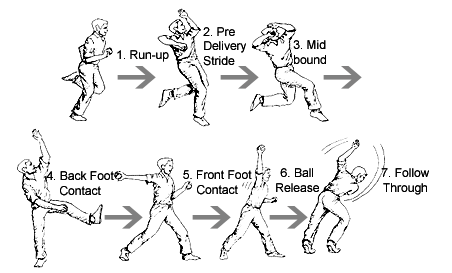 Bowling action is the 2nd part of your bowling. It is the medium or the Crucial point where you stand and deliver the ball on the pitch where you would like to. It is the point where the execution of the ball takes place. The bowling action should not be difficult. It has to be simple action. Even if the action is difficult, it should be comfortable for the bowler to bowl. As long as the action is comfortable, the bowler can have any bowling action. Bowlers need to be aggressive at the time of action. The focus and concentration has to be perfect so that the bowler can deliver or pitch the ball on the right area where he would like to. The bowling has to be with straight high arm action generally. It depends on bowlers. Some bowlers have high round arm action. Whatever the energy is created by accelerating momentum of run-up should be utilized in delivering the ball. The speed of the ball depends on this energy. Whatever the energy is created by run-up is transmitted to your arm, wrist and then to the ball at the time of bowling action. If you are the right handed bowler, the left hand, left leg and back of the body are Crucial in maintaining the balance and in transmitting the energy to your arm and wrist. Similarly to left hand bowlers vice-versa. The back of the body has to be bended properly. If you do not bend your back properly, you may not be balanced and you may not get proper speed. The left hand is so Crucial in balancing the body at the time of bowling action. Do not hide your left hand. The action of your left hand should take place naturally thereby balancing the body movement and transmitting the maximum energy to your arm. The left hand of right arm fast bowler can be compared with the tale of cheetah. When cheetah chases the deer it uses the tale so well, so that the balance of the body movement is controlled in such a manner, you cannot imagine. If you are a right arm fast bowler, the left leg is much Crucial than any other part of the body at the time of bowling action. whatever the energy or the force is created by run-up, it is the left leg which balances the entire force or weight of the body and plays a major role in transmitting the created energy to your arm. So the grounding of your left leg on the crease is Crucial. In general the right arm bowlers ground their left leg in straight or 1st slip direction. It also depends on how you bowl and what type of delivery are you bowling. You can ground your leg in which way you are comfortable as long as you do not lose balance and energy at the time of bowling action. The back of the body, the left hand and the left leg are Crucial in generating the speed of the ball. Do not jump in the air too much at the time of bowling action so that you may loose your balance and thereby the energy created by run-up. You can jump in air in which way you are comfortable as long as you do not loose your balance. 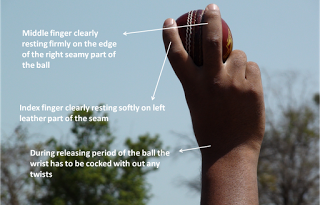 Since the execution of the ball takes place from bowlers wrist, the wrist has to be bent or bended down so nicely so that the energy which is created by run-up should be completely utilized by the arm and then the wrist. The more flexible the wrist, the more the energy is utilized. At the end of the day it is the wrist from where the execution of the ball happens. Follow through is the third part of the bowling. It is Crucial as much as bowling action and run-up. It is defined as the drama which is created naturally by a bowler after the bowling action. The follow through has to be simple and should not be difficult. It shouldn’t be pre-meditated or anticipated action. It should happen naturally or by default. It shouldn’t be in such a way that ” O.K I am going to jump on right side of the pitch or left side of the pitch or in middle of the pitch ” after my bowling action. It is absolutely nonsense. It should happen naturally. 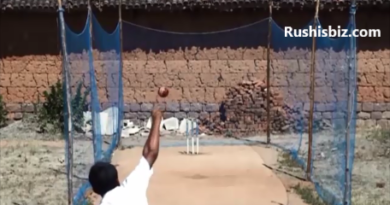 It should happen naturally in such a way that the position of the shoulder, position of the hips and the position of right foot (right arm bowler) has to follow the ball after releasing it. After the following of these positions with the ball, the left leg comes into the party and supports the remaining action. Mind you, naturally your follow through has to avoid the middle of the pitch. Because it is a restricted area and Umpire might warn you. Enjoying Cricket rather than thinking of losing or winning. These points are extremely important especially for bowlers because as we know, today the Cricket is not a balanced game between the ball and a bat, it has become batsman dominated game and most of the pitches in this part of the world are now batsman favored. Not much is left for bowlers. It is the fast bowlers who often get injured in modern Cricket than compared to batsman. He needs to concentrate and work hard more on his fitness than any other player in Cricket. He always has to keep his legs fit and strong which is Crucial in run up. To happen this, running is the best evergreen exercise. The shoulders and arm has to be strong and fit enough, which is Crucial in bowling action. Here strong and fit doesn’t mean to have the heavy body with great muscles. By naturally you have to become strong and fit. By artificially i.e by going to gyms you can also become strong and fit, but running is always the best natural exercise for fast bowlers. You know its not like the batsman who always stands in crease for whatever time he wants, its you the bowler who should always run for every ball to bowl from a long distance. Just having the talent is not enough, as a player you have to have commitment and temperament. Lets say on a pitch you are not getting swing, bounce and nothing from hit. And only choice for you is to bowl straight wicket to wicket in line and length. Here comes the word ‘commitment’, now it tests your commitment, that is how much you are committed to bowl in line and length consistently. We can have other example, if a batsman sledges you in many ways you can loose your patience, then now it tests your commitment towards your patience and discipline. It is already said earlier the talent along with temperament is Crucial. Lets a new bowler in a Test Match is bowling to a good batsman. We know a good batsman always attack debut ant bowlers, so whatever the bowler bowls, he is been hit every where on the ground, he was unable to stop him from hitting, he is trying too many things i.e experimenting too many variations, he was unable to stick on one variation or one plan or one strategy which simply implies he was unable to maintain his tempo. Even though he has the talent i.e has bowled so many variations, but didn’t controlled his temperament i.e by not sticking to the one strategy or one plan. Approach is Crucial when you are a new bowler or regular bowler or when you are bowling to a great batsman. when bowlers are new to International Cricket they generally bowl in a normal way, but if they attack the batsman with positive framed mind thats a good approach. As a bowler if you are attacking the batsman continuously and the batsman is still going on you and still if you attack him with confidence thats a sign of good approach. If a batsman attacks you, don’t get defended its a bad approach. If a batsman attacks you, as a bowler if you still attack them its a good approach. Because the best way to defend or overcome the opposite attack is attack. Patience is the important word in every department of the Cricket say batting, bowling, fielding. 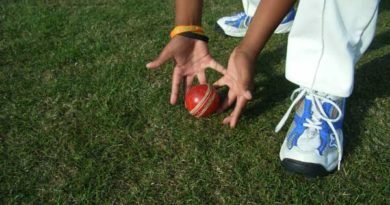 Lets say in a Test Match as a bowler you are bowling on a particular area outside the off stump consistently and the batsman is leaving the ball continuously, but even if you are still having patience to bowl on that particular area consistently which is a wicket taking area, the batsman may loose his patience and may snick to that and gets out. Similarly this example can be applied to other deliveries like bouncers, out swingers etc.. As a bowler if you are bowling bouncers consistently, the batsman is leaving continuously, but even if you are still having patience to bowl bouncers consistently, the batsman may lose his patience and may hook that and gets out. This is how patience of one player dominates the patience of other player. Not only for the Cricket players, Discipline is key to success for every sportsman in this part of the world. Discipline in Time maintainence, discipline in fitness, discipline in commitment, discipline in Temperament, discipline in Patience, discipline in Concentration, in other way you can define discipline as the collection of all good things. Enjoying the Cricket game is Crucial rather than playing for win or lose. Ofcourse you always play for win but without enjoying the game you cannot win. At the end of the day one has to lose and one has to win. Everyday you can’t win the game. Every one has the talent but it is important how you play on that particular day or on that particular instants. Class, skill and talent are always permanent. But form is not permanent. At the end of the day it is just a game, battle between winning and losing not a battle between life and death. By enjoying the game you can make your head cool and release your pressure which is created by your own. With a cool head you can concentrate more, you can make the game so simple and can work on more strategies. Losing the game is not a factor, how you lose is Crucial. Not losing the game so easily but with tough fighting spirit with the opponents is important, which can be possible by enjoying the most amazing game of this world.